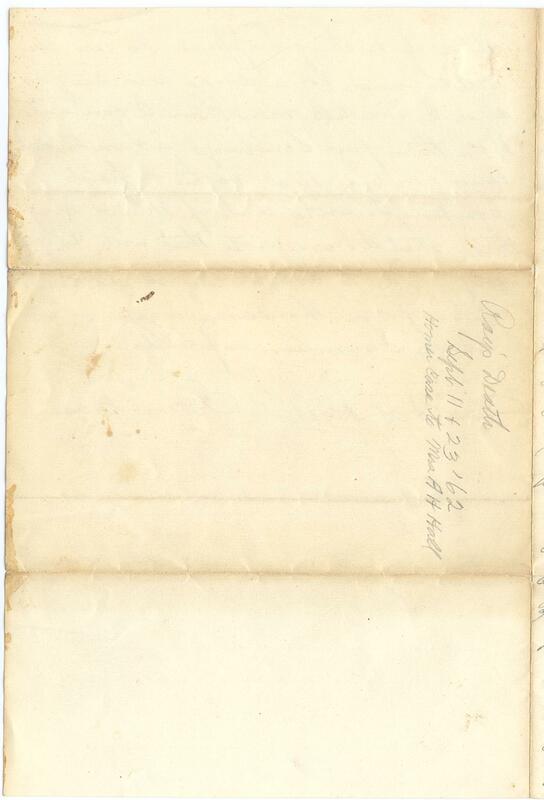 Item description: Letter, 23 September 1862, from Homer Case of the 12th New York Infantry to Mrs. A. H. Hall, sister of William Ray Wells, private in the 12th New York Infantry Regiment (“Onondaga Regiment”). 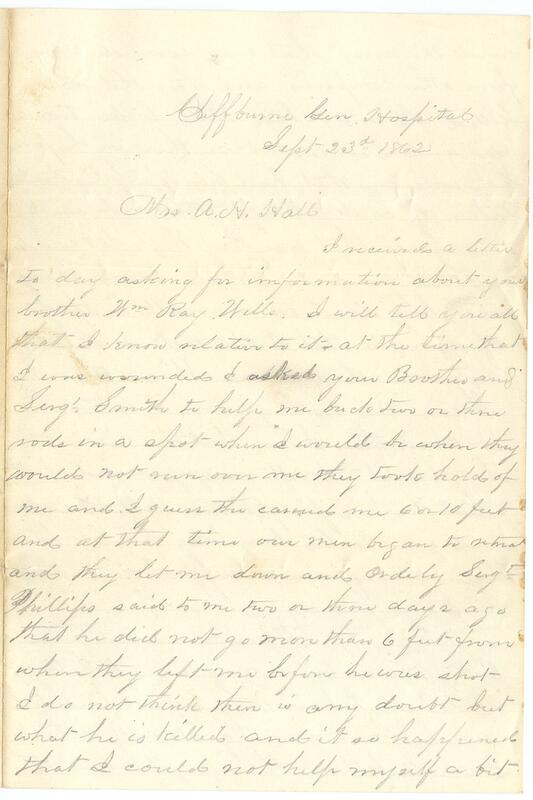 Case wrote from Cliffburn General Hospital in Washington, D.C., to Mrs. Hall to tell her what he knew of her brother’s presumed death at the Second Battle of Bull Run, 29 August 1862. Item citation: From folder 4 in the William Ray Wells Papers #2960 in the Southern Historical Collection, Wilson Library, University of North Carolina at Chapel Hill. I received a letter to day asking for imformation about your brother Wm Ray Wells. 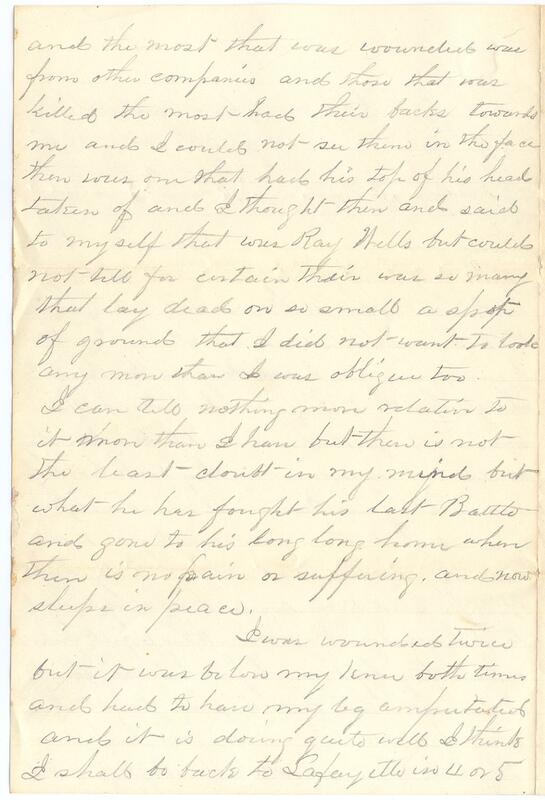 I will tell you all that I know relative to it–at the time that I was wounded I asked your Brother and Serg’ Smith to help me back two or three sods in a spot where I would be where they would not run over me they took hold of me and I guess the carried 6 or 10 feet and at that time our men began to retreat and they let me down and the Ordely Sergt Phillips said to me two or three days ago that he did not go more than 6 feet from where they left me before he was shot I do not think there is any doubt but what he is killed and it so happened that I could not help myself a bit and the most that was wounded was from other companies and those that was killed the most had their backs towards me and I could not see them in the face there was one that had his top of his head taken of and I thought then and said to myself that was Ray Wells but could not tell for certain their was so many that lay dead on so small a spot of ground that I did not want to look any more than I was obliged too. I can tell nothing more relative to it more than I have but there is not the least doubt in my mind but what he has fought his last Battle and gone to his long long home where there is no pain or suffering, and now sleeps in peace. 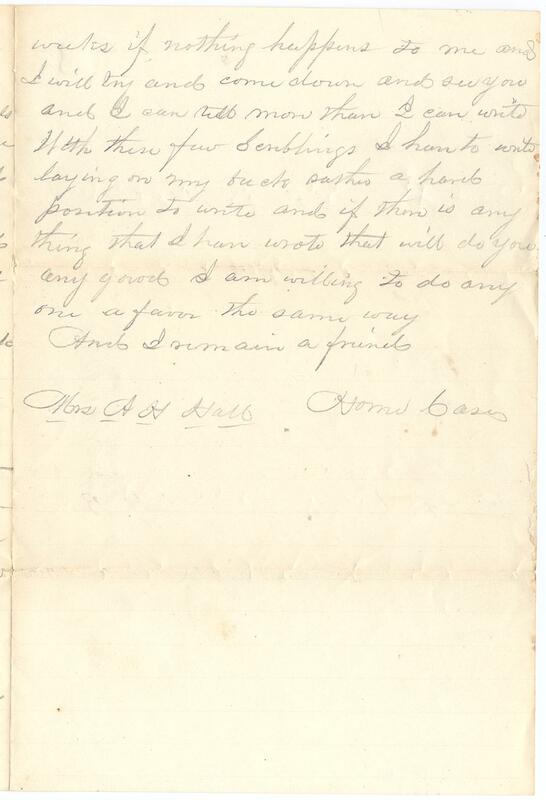 This entry was posted in Southern Historical Collection and tagged 12th New York Infantry Regiment, casualties, Cliffburn General Hospital, Homer Case, hospitals, New York, Onondaga Regiment, Second Battle of Bull Run, Second Battle of Manassas, William Ray Wells. Bookmark the permalink.